Enduring affliction, pushing through obstacles, enduring opposition, striving for a goal, reaching for the prize - that's what the character quality of perseverance is all about. Ups & down in life provides opportunity to test ones strength & courage how he carves out success in mist of storm of problems & obstacle. Success becomes mirage when one does not keep cool & confident in the event of challenging moment. When you do something per your convenience reflects your positivity towards endeavor. But if you do something with focused efforts, with no excuse & giving hundred percent of ability & capability reflects commitment. I will succeed, not surrender. Life is not a bed of roses, But you can chose to make your own roses. Learn to smile at things that use to break you. 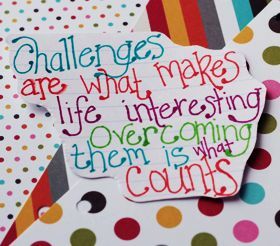 Challenges or testing, trying and conflicting situations are a part and parcel of life. You are bound to face challenges of different types during each day you live, throughout your lifetime. But facing challenges and overcoming them helps us in molding us into a better, stronger and much more evolved individual. Overcoming challenges requires patience, persistence and perseverance. To direct a conflicting situation in your favor, you have to keep persevering consistently. Moreover, you need to have the patience and the belief that things will start working for you, eventually. Attract positive things and you are likely to face positive circumstances. You can only steer your way through challenges only if you persevere and show your strength of character in such hard and nerve-wrecking times. Challenges bring to the fore the true character of a human being. Overcoming challenges valiantly is essential if you really want to grow higher in life.